Come relax in our two-bedroom, two-bath house with a large ocean view lanai. The house is on a quiet street that runs along the ocean and has two parks within easy walking distance on the coast. You will often find there are more walkers than cars passing below our lanai. The house is very nice, offers views of the ocean from nearly every room, and the living room features Island style furniture. The master bedroom has a very comfortable king size bed with a large walk-in shower. The kitchen is fully equipped and has everything you will need to prepare the meals which you will likely enjoy while sitting on the lanai. There aren't that many volcanoes in the world, and how many of them can you walk on? Speaking of which, the new East Rift Zone eruption has paused and all is quiet. But have no worries if the lava begins flowing again as our home is in a safe location with some of the best air on all of the Islands thanks to the trade winds. Hawaii National Park will be reopened soon – an easy one hour drive from our doorstep. Pahoa with its mix of cowboy and Victorian character with wooden sidewalks is close by and has some of the best small restaurants in East Hawaii. The Maku’u Farmers Market on Sundays is close to our home and continues to thrive. While you are there you can pick up some produce or buy gifts for family and friends back home. Try some Lava Candy, local honey, and lilikoi jam. For a special treat on Wednesday evenings you can drive past the steaming vents to Kalapana to visit Uncle Roberts Awa bar and Farmers Market. While you are there you can listen to great Hawaiian Slack Key guitar music, watch some hula dancing, and enjoy dinner choosing from the many vendors. This market is another good place to buy gifts for family and friends back home. Hilo has old-Hawaii storefronts and offers many attractions including swimming and snorkeling at safe beaches. It has a large Farmer’s Market on Wednesdays and Saturdays. Hilo has many cultural events (such as the Merrie Monarch Hula Festival and the Big Island Hawaiian Music Festival). If you have time you should check out the free Mokupapapa Discovery Center for Hawaii’s Remote Coral Reefs which is located in downtown Hilo. There is much more to see and explore in East Hawaii — or you can just sit on the lanai, listen to the birds, watch the waves, and look for whales. We area recently retired couple hoping to move to our Hawaii home some day. Until we do so we are letting others make use of our home for their vacation. We take much pride in making our home a very comfortable place with all the amenities you could need. But you do not have to take our word alone - you can read the comments in this listing from the many renters who have stayed in our home. Before we bought this home we had stayed in many vacation rentals on the Islands so when we set ours up we knew what distinguished one from another. Our home is different from many in how little traffic you will see. It is not unusual to be sitting on the lanai on a lazy Saturday afternoon gazing at the ocean and not see any cars for an hour. The windows throughout the house provides an ocean view from nearly every room in the house. Large walk-in tiled master shower. The ocean is right across the street. The house is on a quiet gravel road. 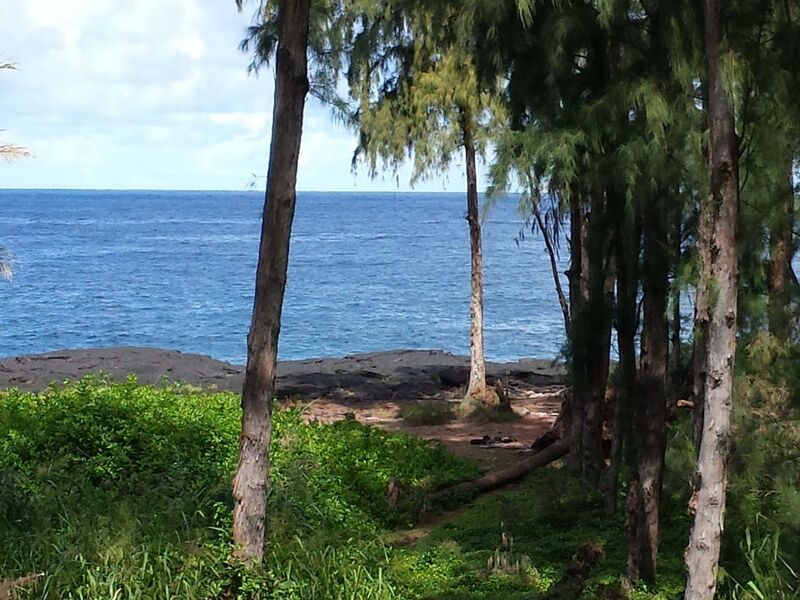 We are directly across the street from the ocean and the lava cliffs. Excellent spot to watch for whales in season or dolphins, turtles, etc. anytime. Or just sit on the lanai and do the same. The waves here can be spectacular. Free long distance within the United States and Canada. High quality sheets, towels, beach towels, etc. Plenty of towels and beach towels. All the dishes and utensils you will need. All the usual kitchen appliances. Ocean view from kitchen too. View of the ocean from the dinning room and the kitchen nook. Standard cable (Oceanic Time Warner) with HBO. Boom box with some CDs. Easy to use - a few movies provided including one of the Merrie Monarch Hula Festival. Many travel books on Hawaii and plenty of fiction too. Many games including a couple Hawaii games. Some CDs with an emphasis on Hawaiian music. Mostly just games but if the little ones look around they may find a stuffed animal or two. The public course in Hilo is popular and not too expensive. Even though we were quite unlucky with the weather, having a lot of rain, this spacious home and its surroundings allowed us to enjoy a very pleasent and relaxing vacation. We had every comfort we needed. The owners provided detailed and helpful instructions for the house and for exploring the Hawaii island. This is a great place to relax. It has great ocean views and you can walk to the cliffs edge on a little path right across the street. The place is very spacious and well equipped. Beautiful wood floors, large rooms, and well stocked kitchen. Large lenei to sit and relax. They thought of everything. The rental process is a little tedious. You have to sign and return an agreement but I think it is that way because they want to keep it as pristine as possible. Thanks you for your review. We are glad you enjoyed the view and our home. You are welcome back anytime. We enjoyed our time spent in this home. It is in Paradise Park and we specifically stayed in that area to see what the neighborhood was like and we really liked the community and this homes proximity to the ocean. Every night we fell asleep listening to the melodies of the resident wildlife with the crashing waves in the background. The house itself is well maintained and had plenty of space for our 4 family members. Thank you Terri for your review. We are happy that you enjoyed your stay. We loved hiking around on the lava cliffs directly across the street, which were wonderfully accessible. Our son had fun trying to find the petroglyph. As far as the house goes, Michael and Terry are clearly experienced with guests and had thought of everything. From beach chairs to the well-stocked kitchen utensils and condiments. They even had a small Christmas tree put out for us, since we were spending the holidays there. Our son also enjoyed finding the classic board games and dominoes. The house had lovely cross breezes and between the screened windows and the fans we were able to control the temperature to our liking. A few reviewers have seemed overwhelmed by the house instructions, but we found them to be very common sense and not difficult to comply with at all. The owners were very communicative and left excellent guides to both the workings of their home and excursions to the surrounding area. Overall we had a great experience and were glad to have a chance to spend time in this area of the Big Island. Thank you Martin for taking time to leave a review. My wife and I are glad you and your family enjoyed our home and East Hawaii. We hope the New Year brings you great luck and prosperity. The view from the lanai, master bedroom and living space is beautiful. This place is spacious, clean and comfortable. The neighborhood is quiet and friendly. The owners, Michael and Terry, are extremely helpful and the information they provide invaluable. We also enjoyed the cd’s, games and books that are there. We had a great stay! Connie, we are glad you and your family enjoyed our home and the area. Thanks for being good guests and for taking the time to write a review. You are welcome back anytime. absolutly beautiful and as advertised! We very much enjoyed our time spent in Keaau. The house was beautiful and had everything we needed for the week.We really hope to be able to come and stay again.I never want to go home. If I could i would give it a 6 star rating! Cheryl, we are glad you enjoyed your stay and thank you for taking good care of our home. You are welcome back any time. Come relax in our two-bedroom, two-bath house with a large ocean view lanai. The house is on a quiet street that runs along the ocean and has two parks within easy walking distance on the coast. You will often find there are more walkers than cars passing below our lanai. The house is very nice, offers views of the ocean from nearly every room, and the living room features Island style furniture. The master bedroom has a very comfortable king size bed with a large walk-in shower. The kitchen is fully equipped and has everything you will need to prepare the meals which you will likely enjoy while sitting on the lanai. Thanks to the trade winds our home has some of the best air in Hawaii. There aren't that many volcanoes in the world, and how many of them can you walk on? Speaking of which, the new East Rift Zone eruption is still underway as Pele forms new land. But have no worries as our home is in a safe location with some of the best air on all of the Islands thanks to the trade winds. Yet you are just a short drive from the volcanic activity and at night the orange glow can be spectacular. The Hawaii government has said they hope to soon be opening a viewing area. During the day you can drive towards nearby Pahoa and you will be able to see the gas\steam plume from Fissure 8 and the local weather it creates. This can cause it to be raining in Pahoa but sunny and dry at our home. Hilo has old-Hawaii storefronts and offers many attractions including swimming and snorkeling at safe beaches. It has a large Farmer’s Market on Wednesdays and Saturdays. Hilo has many cultural events (such as the Merrie Monarch Hula Festival and the Big Island Hawaiian Music Festival). For the time being the Volcano National Park Service has relocated to downtown Hilo at the free Mokupapapa Discovery Center for Hawaii’s Remote Coral Reefs. There is much more to see and explore in Eastern Hawaii — or you can just sit on the lanai, listen to the birds, watch the waves, and look for whales.